A simple idea that has never lost its impact, imprinted balloons are an eye-catching and positive way to express your message. Choose an option that fits your needs. 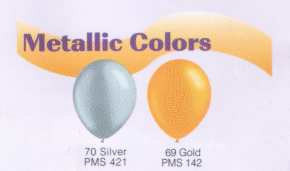 A simple one-color, one-sided imprint is our most economical option, with fancier balloons costing only slightly more. Double the impact of your message with a two-sided imprint. Impress everyone with two-color artwork on both sides, a photo imprint or an over-all wrapped print. See examples on the right to view the options; pricing table and balloon colors shown below. Call 1-877-884-2402 or email: contact@giant-inflatables.com with any questions or for a detailed quote. 12" Latex One Color/Two sides with different artwork on second side. 12" Latex Two Color/Two sides with different artwork on second side. Included in one sided, standard pricing. Ideal for weddings, birthdays, etc..
One color photo, Photo screen charge. Use for logo + message. Shows tones for a dimensional effect. Photo screen charge. Gold or Silver, other special colors. Included in most standard pricing. Included in two sided, standard pricing.